One of the most popular games of all time is Grand Theft Auto. 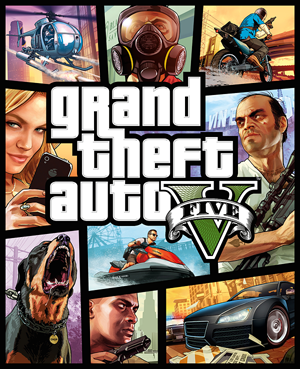 The game features particular missions, in which the characters, or you—depending on game setting—navigate a fictional world to accomplish a goal. Many people play the game “properly” in that they fulfill the expectations of the missions and engage in lots of mayhem. Others, like in life, choose a different path. Disclaimer: I am not a gamer. I have played a video game perhaps twice in my life for less than ten minutes total. If games were made up of a set of tasks that taught its user skills, such as a method that a child might study and overcome logic problems, I would be happier with them. Instead, they just seem to be about losing time and having nothing to show for it other than momentary and frivolous excitement. I am much less interested in virtual worlds than I am the one we’re in, and even in the books I write I am less interested in aliens and zombies and magic and gods and dragons than I am the possibilities of humanity, the biological and mechanical world, and scientific advancements. The books I enjoy are more like science textbooks set in the future. That makes me a poor person to review any game, let alone one which is purportedly increasingly complex, shifts with upgrades and in the online version, and has multiple players involved. Not surprisingly, this is not a review. Recently I heard from my friend that people were playing such games but playing them against the grain, as it were. You can read more about that on the tumblr, No Wrong Way to Play. I’m not sure if this is ornery humans breaking the rules for fun, encountering a system and messing with it for fun or interest, or if they have merely stepped off the path of conformity and haven’t found their way back. Instead of tearing through stop signs and running people down, and in general taking out their infantile anger about their real world life in a virtual environment, some merely visit the Grand Theft world and conduct what otherwise might be a regular life. Eerily similar to the Metaverse in Neal Stephenson’s Snow Crash, this version of the popular game forces it to work against its own rules. Setting aside the contrived mission, these gamers drive cabs, work at jobs, walk down the street, and in a hundred other ways avoid what most of the gamers are trying to do. Seeking a break from their own lives, for any of a hundred reasons, they flex their mental muscles in this safe and stable setting. For me that is a much more interesting phenomenon than people merely shooting and running stop lights. There are people out there forcing the game to work outside its stated intent, and some of the writers of the game have recognized that and coded in those possibilities. As that style of gaming becomes more popular, presumably the games themselves will become much more nuanced and complex, and the shoot ’em up types will be condemned, as they typically are in broader society, to standing alone by the school yard fence or bullying other children on Facebook. In a no-kill playthrough, the last option seems like the most reasonable one to pick, right? As Hinckley progresses through his playthrough, though, it becomes obvious that the game literally doesn’t know how to deal with a player who pacifies everyone into submission. So, he starts experiencing weird audio problems related to that peaceful mechanic. More notably, though, when he convinces the dame to leave, the game bizarrely spawns an enemy where it shouldn’t, and this forces the peaceful encounter to become violent once more. Normally, this wrinkle can be dealt with fine—Hinckley can simply pacify the characters again. The problem is, after calming everyone down, the game borks itself. Characters won’t continue their dialogue like they’re supposed to at that point. How far down the rabbit hole can we go seeking the bottom, which in a virtual world, is only limited by our intent and the game’s nested circles? With the many millions of collective hours poured into gaming around the world, with whole industries devoted to creating and marketing worlds for people to play in, and a multiplicity of people and reasons they game, I’m sure we’ll find out. This entry was posted in Art, Culture, Internet, Singularity, Social Media and tagged against the grain, Fallout 4, gaming, Grand Theft Auto, Metaverse, Neal Stephenson, Snow Crash. Bookmark the permalink.